In April 1854 the government approached Guildford Corporation with an offer of 100,000 in return for a camp for 20,000 soldiers on the Hog's Back. This was rejected and the government then offered it to the village of Aldershot, which accepted with alacrity. In 1873, however, Edward Cardwell, who lived at Eashing and was Secretary of State for War in Gladstone's first ministry, decided that Guildford, like all county towns, should have a barracks. Stoughton, still mainly open fields at the time, was selected as the site. Building work was completed in 1876, including the construction of the imposing brick keep. Occupied in October of the same year, the Queen's Royal, 2nd Regiment of Foot took up residence in the barracks then named the 48th Brigade Depot. In 1881 the number was dropped from the Regiment's name and it was renamed The Queen's Royal (West Surrey) Regiment. Over the Regiment's long history, it was to have its name changed several times until in 1966 it formed part of The Queen's Regiment. The Queen's Regiment today no longer exists, with the formation in 1992 of The Princess of Wales's Regiment. The new regiment headquarters is now in Canterbury a long way away from both the original Stoughton Barracks and the Regiment which occupied it, The Queen's Royal (West Surrey) Regiment. THE Queen's Royal Regi­ment still dominates the scene at Stoughton. though bar­racks have become bedrooms with frills. The first part of the con­version to be completed, houses a tribute to the regi­ment, which had Queen Mary as its colonel-in-chief, with a temporary museum holding a re-created barrack bed­room, memorabilia, photo­graphs and uniforms. A display of military el­egance from the period pecu­liar to the regiment has been borrowed from the Princess of Wales's Royal Regiment's museum in Dover. The uni­forms include those of an 1881 captain of the Rifle Volunteer Corps and a post-World War One major's battledress. It was at Stoughton that raw recruit Michael Caine was trained before going to the Korean War. and in 1959 part of the film. Carry-on Sergeant, was shot there. From 1959 to 1983, the barracks were used as a Pay and Records office, after which it remained empty until March 1994 when the developers. Countryside, bought it. Retired Lt Col Les Wil­son, honorary secretary of The Queen's Royal Regimen­tal Association, arranged the exhibition. He praised the developers saying: "They have taken a lot of pains to retain many of the old fea­tures." Steve Stone, managing di­rector of the South Thames region, said: "The council has been very concerned with preserving the original style, so the shell has had to be refurbished as it was." Once developers were coming forward, the council designated the south part of the site as a conservation area. The chief planner at Guildford Borough Council, Huw Banister, said: "In terms of the appearance from Stoughton Road it will remain very much as it always has been. Overall we are very pleased with the development." The old Depot of The Queen’s Royal Regiment. Victorian buildings at Stoughton Barracks which once housed The 2nd Queen’s Regiment and The 2nd Surrey Militia now have conservation status. Guildford Borough Council has decided to designate the southern part of the barracks as a conservation area. This will include the Peterborough and Tangier barrack blocks, the Quartermaster’s offices, the Keep, officers’ mess and married soldiers’ quarters. The council’s conservation officer, Mr. David Clegg, in his report on the issue to a recent meeting of the planning committee, stressed that the high wall and gates around the barracks merited retention if possible. Stoughton Barracks is owned by the Ministry of Defence. It has been empty and surplus to military requirements for a number of years. There is a current outline planning application for 190 residential units on the 13- plus acres of land at the barracks awaiting decision by the planning committee. The mostly brick buildings within the conservation area were built in the 1870s, enclosed on three sides the high wall which has survived. It was common in those days for military building and architecture to be carried out by officers of the Royal Engineers. Stoughton Barracks were built under the direct supervision of Lieutenant Elliott Wood, assisted by Sergeant Major Snelling. In his report Mr. Clegg said that the Keep and officers’ mess were “particularly notable buildings”. The Keep was identical to a similar structure in Reading which had been listed by the Department of the Environment. The borough council has requested the DoE to include the Keep on the statutory list of buildings of architectural interest. Mr. Clegg said the officers’ mess was the “grandest building” on the site. Its handsome entrance porch was supported by Aberdeen marble pillars with carved Portland stone caps and bases. There were also a number of good trees on the site which provided an attractive framework for the barracks and which should be retained wherever possible. “We feel the area has historic character and distinct architecture. It is up for residential development so not all the buildings will be kept. Some could, perhaps, be converted to residential use”, Mr. Clegg told the committee. Mr. Christopher Fox (Lib.Dem.,Stoughton) said there were other buildings not included in the proposed conservation area that were worthy of conservation - the Royal public house, designed by Henry Peak, and a row of cottages - but his suggestion was not taken up. The committee agreed that the southern part of the Stoughton Barracks complex which contained all the main buildings of architectural and historic interest, should be designated a conservation area. In 1873 Edward Cardwell, who lived a Eashing and was Secretary of State for War in Gladstone’s government, decided that Guildford like all county towns should have a barracks. At the time the site chosen was open fields. 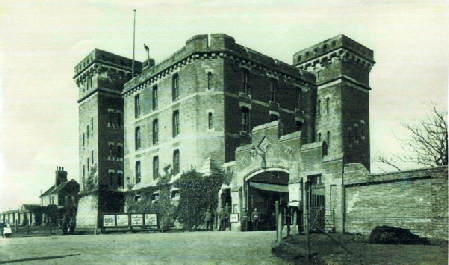 The barracks was occupied in 1876 becoming the 48th Brigade Depot Under the Cardwell reforms of 1881, the number was dropped and the Depot renamed The Queen’s Royal (West Surrey). It is of interest that between 1876 and 1900 neither the 1st or the 2nd Battalion spent more man six years altogether in England, serving in India and Ireland. Note: If you are in the Guildford area it is worth a visit to the Stoughton Barracks Redeveloped Site now that the work has been carried out.